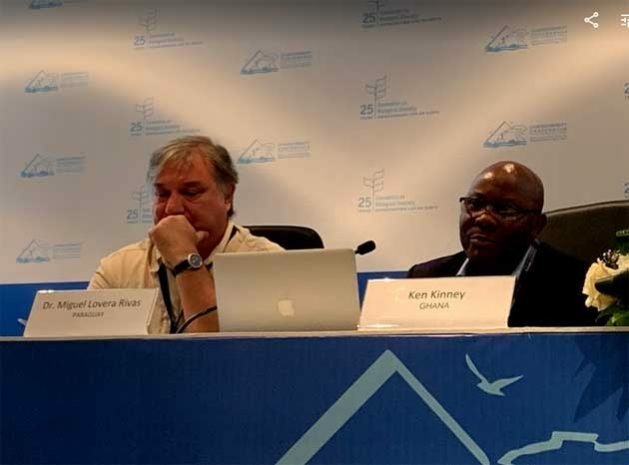 SHARM EL SHEIKH, Egypt, Nov 21 2018 (IPS) - A discussion held earlier this week at the ongoing Convention of Biodiversity’s (CBD) Conference of Parties in Egypt highlighted that grants to curb deforestation in the Amazon are not enough if they are accompanied with investments that increase the loss of biodiversity. “Parties are talking about ‘investing in biodiversity’, but we need to talk about divesting from biodiversity destruction,” stated Isis Alvarez of the Global Forest Coalition (GFC), a worldwide coalition of NGOs and Indigenous peoples’ organizations from 60 different countries striving for rights-based, socially just forest conservation policies. Incentives to produce and export meat and soy in major producer countries like Brazil, Paraguay, and Argentina — or the “United Soy Republic” according to GFC — are a leading cause of deforestation and biodiversity loss, according to a briefing document prepared by GFC for the discussion at the ongoing Convention. Originally launched in 1992 as part of the Rio Earth Summit, the Convention on Biological Diversity is a global agreement among 196 nations that represents the growing global commitment to sustainable development. In the next two years it aims to define a post 2020 global framework on biodiversity to be adopted in Beijing in 2020 — much as the Paris Agreement did in 2015 for climate change. UNCBD’s Aichi Targets that were set out in 2010 to be phased out in the next 10 years, states that incentives, including subsidies, that are harmful to biodiversity, need to be eliminated, phased out, or reformed in order to minimize or avoid negative impacts, while positive incentives are developed to support alternatives. GFC highlights that, while grants are being provided in efforts to “conserve biodiversity” of the Amazon, the livestock and feedstock industry (mainly soy) are continuing to receive significant incentives, including subsidies and tax cuts. “The biggest driver of deforestation is agriculture. Farmers cut forests to provide more room for planting crops or grazing livestock,” says Alvarez, a Colombian biologist and member of the GFC. GFC states that the Paraguayan Chaco region is being deforested at the rate of 1,000 hectares per day due to cattle ranching and soy monocultures, the highest rate of deforestation in the world while meat and soy companies here are receiving multiple tax incentives. Brazil, for example, continues to be one of the countries with the highest deforestation rates on the planet. Between 2005 and 2015, the Brazilian government invested $3.18 billion in the livestock industry – 90% of which went to just three corporations. In 2017, $48 billion went to agribusiness companies in the form of cheap credit while only $115.6 million was allocated to combatting deforestation and forest degradation. Deforestation in Brazil’s Amazon has also jumped by almost 50% during the three month electoral season that brought Jair Bolsonaro to power, according to preliminary official figures. Between August and October, nearly 1, 674 square km (an area more than double the size of New York City) of forest was converted to pasture— making the deforestation rate go up to 273%. To put it in perspective, the rate stood at 114% during the same period last year. And while experts observe that deforestation usually increases in Brazil’s electoral years amid promises from local politicians they tp open up protected land or make environmental legislation more flexible, far-right candidate and now president-elect Bolsonaro has added a powerful permissive voice to agribusiness, land-grabbers, illegal gold miners and loggers. Aside from deforestation, reports show that the livestock industry is also causing significant negative impacts on local communities, animal welfare, and the environment. “Much of the land for livestock in Paraguay was acquired via land grabbing, while wages paid by ranching operations are a third of the national minimum wage,” says Miguel Lovera of GFC’s Paraguay hub. The discussion at the Convention proposed that alternatives to support biodiversity conservation the paper proposed a rapid reduction in meat and dairy consumption and incentives for small-scale, localized, and ecologically sound food production as well as community conservation initiatives.